Vendor aging reports show unpaid invoices from Accounts Payable. These reports show how much you owe to vendors. Both show essentially the same information -- accounts payable -- but in more or less detail. 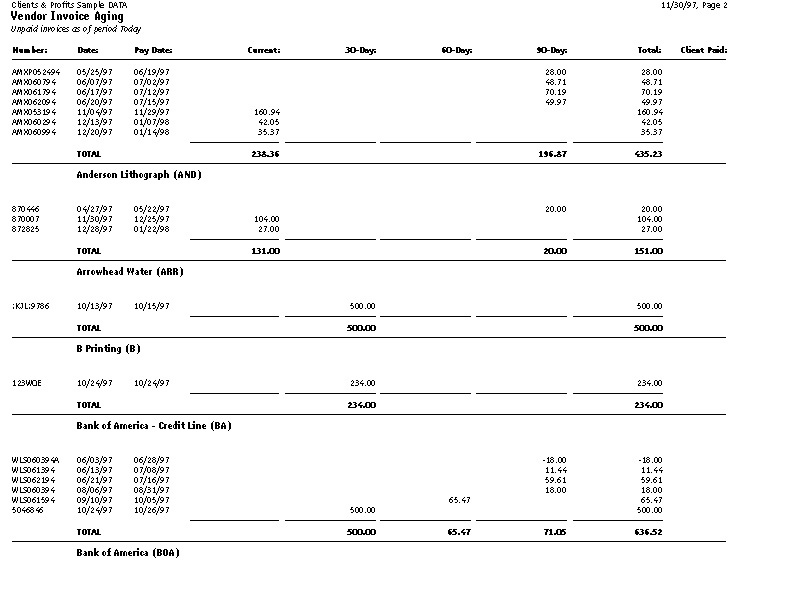 The Vendor Invoice Aging shows individual unpaid invoices by vendor. 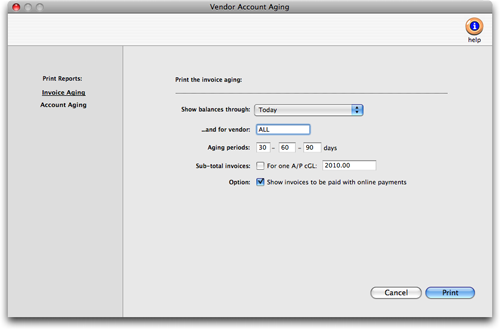 The Vendor Account Aging doesnt show invoices; instead, it shows account totals only. Vendor agings can be printed any time during the month, but especially at month-end. 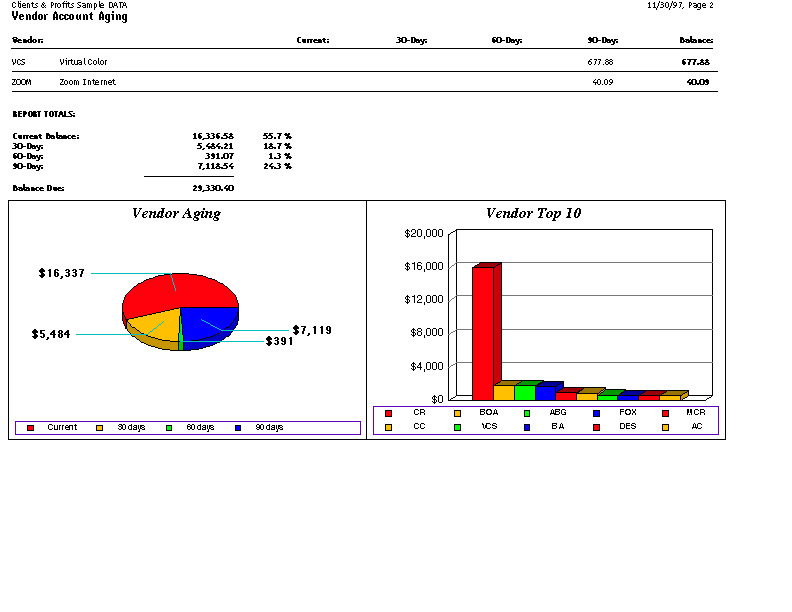 Vendor aging reports are always up-to-the-minute accurate, showing any posted invoice with a balance due. They can show what you owe as of the moment the report is printed or what was owed through a prior accounting period. Vendor account balances can be aged into the current period and three user-defined periods (e.g., 30, 60, 90 days). These periods are flexible and can be changed any time the agings are printed. Any set of aging periods can be used. The aging option recalculates the unpaid balance based on todays date and your aging periods. Your aged balances will only be accurate as of the last aging. Vendor aging reports arent based on data from the General Ledger. Instead, vendor aging reports are based exclusively on unpaid invoices from Accounts Payable. So what youre seeing on vendor agings comes from your payables, not from journal entries. For this reason, they have the potential to be confusing. The vendor aging reports show a grand total at the bottom of each report. The balances on the vendor invoice aging will always match the vendor account aging -- theyre both based on unpaid payables, after all. Since Accounts Payable is integrated with your General Ledger, your payables balances on the Balance Sheet should equal the balances on the aging reports. In some cases, they wont match -- for an obvious reason: journal entries posted directly into the General Ledger for the A/P account do not affect vendor balances, and therefore the vendor account agings. For this reason, dont make adjusting entries to the G/L for the A/P account; instead, make your adjustment directly into Accounts Payable. Vendor agings can be printed for some date in the past. The total balance due should always match the Balance Sheet printed for the same accounting period. Each production report has its own selections, which dont affect the other reports. For example, you can print a status report listing jobs with status 1-50, while also printing a traffic report showing jobs with status 1-999. 1 Choose Snapshots > Vendor Account Aging. 2 Choose the kind of aging report (i.e., Invoice Aging or Account Aging). 3 Select to show balances through today or through a prior period. 4 Enter your aging periods. These periods are used to calculate aged balances for every invoice, based on the invoice date and todays date. You can use any set of aging periods, including a different set each time you print vendor agings. 5 Choose your aging options. To see only invoices for one vendor, enter the vendor code, or use ALL for all vendors. To see invoices for one specific A/P account, enter the payable account number. The aging process can take some time if you have many unpaid payables. Since aging is a demanding procedure, its best to age your accounts when few users are using Clients & Profits X. Heres what happens: Clients & Profits X first clears the existing balances for every vendor. Next, the program checks Accounts Payable for unpaid invoices. Every unpaid payable is evaluated, and its balance aged based on the invoices date, todays date, and your aging periods. The invoice then updates the vendors balances. The Client Paid column on the Invoice Aging report helps you pay only the A/P invoices that have been billed and paid by the client. When a client pays their A/R invoice, the A/P invoices billed on that invoice are updated with the date the client paid. In order for the Client Paid column to be updated, the accounts payable invoice must be posted first, then the client is billed with an accounts receivable invoice that bills the actual cost, next the accounts receivable invoice that bills the cost needs to be paid. This exact order must be followed. You can not verify/recover A/P account balances to update the Client Paid column if this order was not followed.